Recall our discussion from yesterday? No? Well, we started with our "base case" for this business. And then we doubled the search budget for year one. 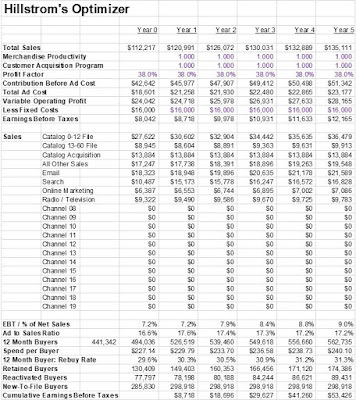 This sub-optimized the business in year one ($0.5 million less profitable) but improved long-term sales and profitability. Losing money in year one was easily the "right" thing to do. What would happen if we doubled the search budget EVERY YEAR? How is the business impacted? Do we sub-optimize short-term profit (yes)? 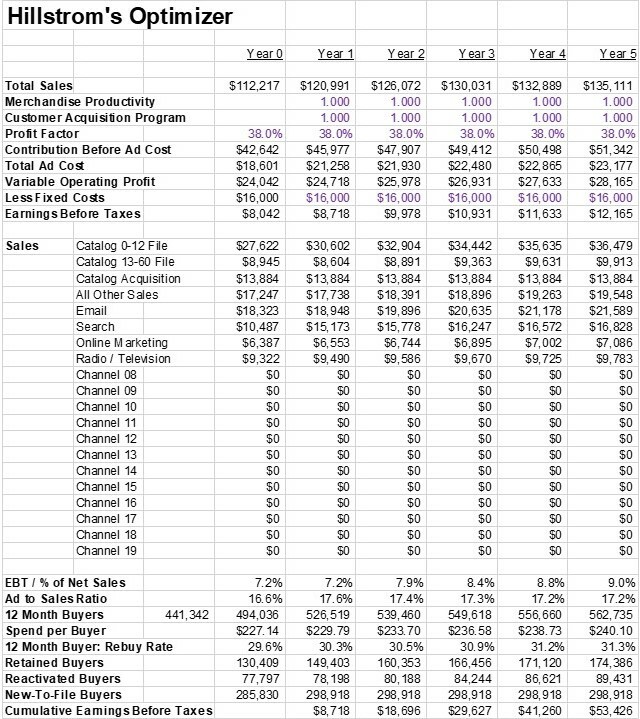 Do we optimize long-term profit? It takes two years, and then profit starts improving. After five years, the business is ten million dollars bigger (sales) and profit is a million dollars a year better ... and cumm five-year profit is better than in the base case. So by sub-optimizing short-term profit EVERY YEAR the business is more profitable over time and is ten million dollars bigger. When you optimize the short-term health of your business, you sub-optimize the long-term health of your business. Yes --- everything you've been taught about business and optimization is probably wrong!! Do you ever wonder why your business doesn't grow like you think it should grow? Hmmm. Do you ever wonder why Amazon purposely chooses to not make a profit? Hmmm. You can learn all these fun tidbits by running Hillstrom's Optimizer ... or by creating your own Optimizer. P.S. : Read this (click here). We're gonna have to pick our partners soon. You might not like that Amazon gets 20% of every sale, but catalogers happily pay co-ops $0.06 per catalog mailed, and then 1 in 100 customers purchase something. So if you have a $100 AOV you're giving the co-ops 6% of every sale, not to mention what you gave your paper rep and your printer and the USPS. Give Amazon 20% or give paper-aligned vendors 40%? Something to consider. And remember - if you do that - if you give Amazon the dollars instead of the Print Ecosystem, you become a pawn to Amazon. They can toss you in the waste basket at any time. You are the one who needs to be strategic. Tepid but predictable business in the Print Ecosystem, or growth aligned with frightening risk in the Amazon Ecosystem? Think carefully about both.